Fewer Americans appear to be celebrating Valentine's Day now as opposed to a decade ago. The National Retail Federation says that 10 years ago, more than 60 percent of adults planned to celebrate the day that's dedicated to love, but that number has dropped to just over half in 2019. Valentine's Day, which is celebrated every Feb. 14, is a day when people show their affection for another person or people by gifting them with cards, flowers, sweets or some other expression of love or appreciation. In 2009, 72 percent of adults between the ages of 18 and 34 said they expected to celebrate Valentine's Day, while 65 percent of people ages 35 to 54 planned to mark the day with their sweetheart. 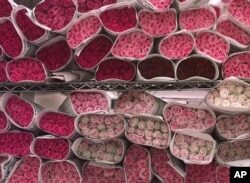 File -- Americans are expected to spend $1.9 billion on flowers for Valentine's Day 2019. Today, just over half of people in those age brackets — between 52 and 53 percent — plan to do something for Valentine's. The main reasons people don't want to celebrate Valentine's Day is because they think it's over-commercialized, don't have anyone to celebrate with, or have just lost interest, according to a 2017 poll conducted by NRF. Some of those who expect to mark Valentine's Day will give sweets to their sweetie. It’s a tradition to indulge in candy on Valentine's, to give and receive it. Americans are expected to spend over $1.8 billion on Valentine's Day candy in 2019. Those who do celebrate Valentine's Day will be spending more, according to the NRF, an average of $162 per person, more than $20.7 billion overall. That could be because more younger people are increasingly interested in giving the gift of an "experience" rather than the traditional flowers, candy or jewelry. About one-fourth of people who plan to mark Valentine’s Day will say "I love you" with an experience such as concert tickets or a day at the spa. They're interested in creating a special memory or simply want to be unique. Memories can be expensive to make. The biggest Valentine's Day spenders, people between the ages of 35 and 44, will spend an average of $279.14 each, while those ages 25 to 34 will spend about $239.07. People who are often recognized by others on Valentine's Day include spouses, significant others, children, parents, friends, co-workers and teachers. And pets. Americans are expected to spend $886 million on their furry companions this Valentine's Day.